Love the look of champagne but prefer the taste of a pop-top beverage? 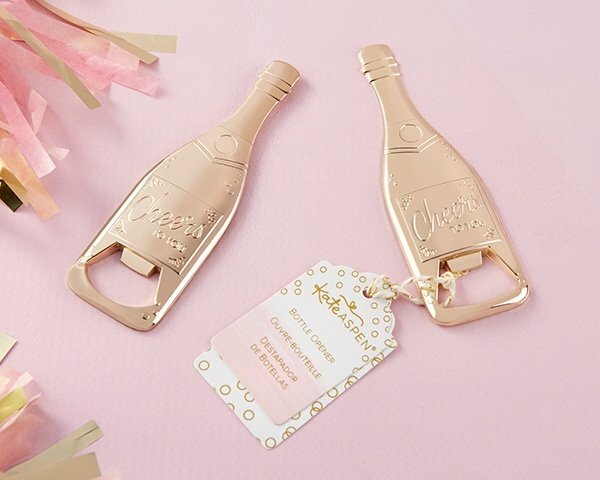 Kate Aspen's Gold Champagne-Shaped Bottle Opener is the perfect two-in-one favor---shaped like a champagne bottle but perfect for popping the top on your favorite libation. 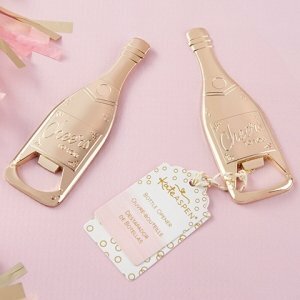 This fun, unique bottle opener has "Cheers to You" engraved on it and makes a great favor for guests at your wedding, bridal shower, bachelorette party or birthday. Can the tags be personalized? I'm sorry the Gold Champagne Shaped Bottle Opener does not offer personanlization but you can order a separate tag here. Is the back of the bottle opener smooth? I would like to have the item engraved with our names and wedding date. Yes, it is. I recommend ordering a sample so you can see the item before ordering it in bulk. Does the bottle opener have a magnet on the back? This Gold Champagne Shaped Bottle Opener does not have a magnet on the back. About the gold champagne shaped bottle openers. Are they packaged in individual bags? I'm sorry the Gold Champagne Shaped Bottle Opener is not individually packed. It's packaged in bulk. They're packaged in clear cellophane bags to protect them during transit. Hi, I wanted to order a sample of 1 item to see how the color actually looks in person for the Gold Champagne Shaped Bottle Opener. Will the shipping for 1 sample be over $8 to zip code 33024 in Hollywood, FL? The shipping fee for 1 sample of the Gold Champagne Shaped Bottle Opener is $5.95 and the estimated delivery date is between Fri (07/20) - Wed (07/25. We charge actual UPS/FedEx rates, but our prices are the lowest! DOES THIS Gold Champagne Shaped Bottle Opener COME IN A INDIVIDUAL BOX? It does not come in an individual box; it's just the opener with the tag.